I loved these chunky wooden angular ovals the minute I first saw them at my local supplier's warehouse. I brought them home and rummaged around in my turquoise box. I found cute magnesite wedges and a genuine Arizona Turquoise focal bead. Voila, I bring you Au Naturale. It's a very comfortable fit for my standard 7" wrist. Anchored by creamy pale coffee-brown White African Opal teardrops, frothing with whipped cappuccino foam, and sprinkled with raw sugar-like fire polished czech glass this necklace is simply eye-catching. Finished with e-coated antiqued brass chain, it is adjustable and measures up to 20 inches. This delightful bracelet is composed from the same pale shade of antiqued pink as the longer Romantic Enchantment necklace I revealed on Monday. I wired soft antiqued pink Biwa stick pearls and round freshwater pearls with fire polished czech glass pink beads. The non-tarnishing antiqued silver wire and toggle clasp lend themselves to the antiqued picture.The bracelet has a German silver s-hook clasp which can hook at any point in the bracelet. I was in the Southwestern frame of mind a few weeks ago. Dark brown snowflake obsidian stones are interspersed with light turquoise-blue magnesite rondelles which match the focal piece cross pendant, all finished with silver. The brown stones lay in an askew manner and not perfectly straight, so if you're OCD this may drive you nuts, but for the artistic mind, the irregularity is appealing. 20.5 inches in length, and I could add an extender chain if you desire. Most of you know I homeschool our children. And an addition number of you know we are in our second year of Classical Conversations, or CC, as the insiders dub it. This year we extended our day beyond the Tuesday morning Foundations memory work to an afternoon grammar class, Essentials. I love this class and am learning some simple grammar tools which were not even addressed in my English major college days. Ian told me today that this was his favorite time of the day, parsing and diagramming sentences, learning "dress ups" to enhance our sentences, and basic writing techniques. One of the "tools" which the children were handed today was alliteration as a powerful literary device, especially as seen in poetry. Yep, I couldn't help myself. Mrs. Gazaway, in honor of your delightful teaching style, I bring you the Excellent Earthy Eggplant bracelet. Not that any woman wants to imagine herself wearing eggplant (amazing plant--you can so many delicious meals with it), but the humor might engage your funny bone. EEE measures a full 8 inches, but the diameter is closer to 7 due to the larger stones. It fits my wrist quite nicely. 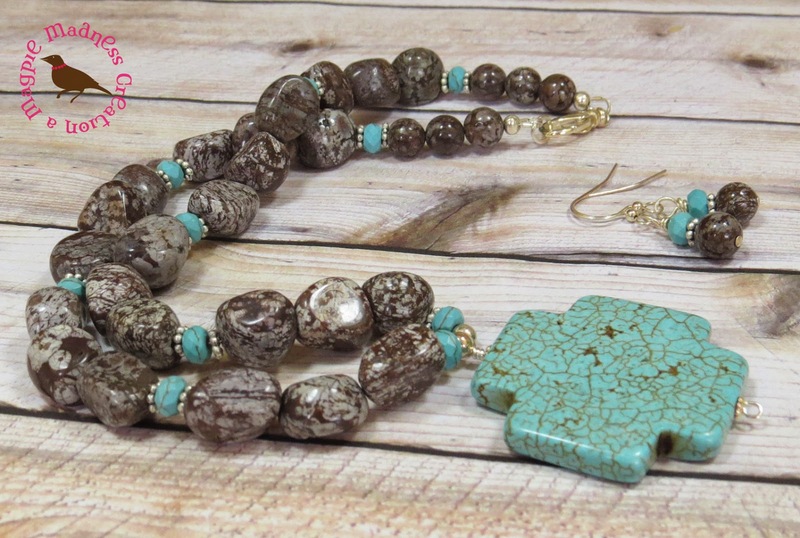 EE is concocted from eggplant-colored magnesite stones, antiqued silver, Swarovski crystals and an earthy carved wooden bead. Bracelet $26, Earrings, $10. I love this soft glossy coin pearl in a soft antiqued pink. I wire wrapped it in antiqued silver (copper core) wire and hung it with a simple fire polished Czech glass beaded accent. The chain as shown is a short 15.5 inches long and is designed to be worn closer to the neck while not as short as a choker. My chain, in antiqued silver is finished adjacent to the clasp with more of the same Czech glass beads. This is a necklace that will wear and hold up well. Need earrings? I always do. These pearls are delightfully wire wrapped and hung from silver leverback hooks. Convo me at checkout and I'll modify for your preferred style--surgical steel french hooks, 1.5" kidney, stud, etc. Buy on Etsy here. All Magpies come charmingly gift-wrapped and ready for giving. I do my best to ship within a day of your order.